So, I've had another one of those extremely busy weeks that result from needing to be very frugal. In other times, when being frugal has been more of a choice, I could do frugal things, as my energy and desire allowed. But in this phase of our finances, I feel urged, constantly, to do everything possible to reduce our spending. I've been employing the usual cost-saving strategies, such as hanging laundry to dry, gardening, cooking from scratch, shopping second hand. But I've also plunged right in to many other active frugal endeavors. I've baked a lot -- from graham crackers to French bread, from zucchini muffins to hot dog buns, and a large batch of biscotti. Baking from scratch saves a bundle over buying these same items at the a bakery or grocery store. I made donuts, not just once, but twice, over the weekend, using my French bread dough, and upping the sugar just a smidge. We estimated that we saved about $10 on home donut-making. And fresh-made donuts are crispy and delicious! I made a large batch of pinto bean sandwich spread for lunches. I followed my garbanzo bean sandwich spread recipe, substituting pinto beans for the garbanzos. 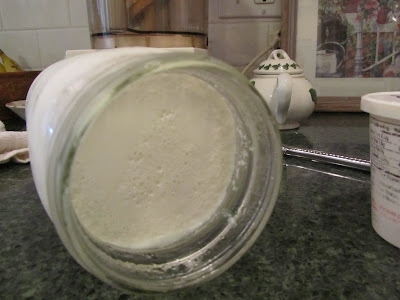 I froze several jars, to use in future weeks. Peanut butter is a standard for sandwiches in our house. But the price of peanut butter has been high the past 2 years. Bean-based sandwich spreads save us about $1 per jar, over jars of peanut butter. I froze my pears, using lemon juice, instead of ascorbic acid to prevent browning (about 2-3 tablespoons per pint container, sprinkled over the blanched pears, before adding sugar syrup). I am hoping we'll enjoy these this winter. If we do, then a couple of favorite recipes that call for canned pears, can be made with my home-grown, frozen pears, saving us a couple of $$ on store bought canned pears. 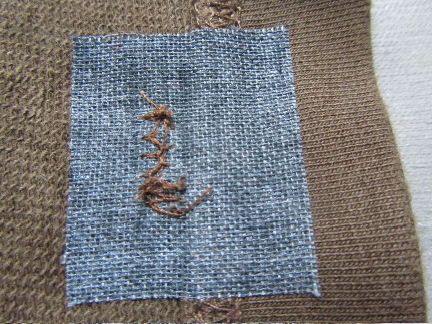 I've been rejuvenating clothing, with patches, dye and taking in seams. I have repaired, restyled and restored 8 pairs of jeans and pants in the last few weeks. I have one more pair of jeans and one skort in my pile to alter. Rejuvenating clothing has saved us over $100. I patched all my daughters' casual socks. I'd hoped to replace all these socks at the end of summer, but now it looks like we need to make them last a few months longer (guess what Santa will be putting in the stockings this December?). New socks would have cost $15 on sale this fall. Santa will be buying socks at an annual 50% off sock sale, the day after Thanksgiving. I made several gifts, both birthday and Christmas. And I'll continue making gifts for the next couple of months. I made these gifts, using only materials that I had at home. I have no idea how much I have saved making gifts. And this type of frugal activity is fun! I made a batch of ketchup. I didn't follow a recipe, but borrowed my ketchup-loving daughter's taste buds, while I combined minced onion, vinegar, tomato paste, sugar, salt, lemon juice and water. It came out to our liking -- very tomato-y. We made a better product, skipping ingredients that commercial products contain, for about 25% less than store-bought ketchup. 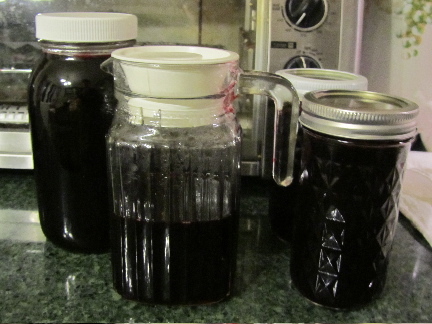 I made a half gallon of wild blackberry pancake syrup. Oh man, is that stuff heaven! One of the jars has been set aside as a Christmas gift. My daughters picked the blackberries for us. We have many places nearby, where wild blackberries are found in abundance. I've been working in the gardens, making them as beautiful as possible, using my efforts in place of new plants. I am saving some money for daffodil bulbs, for a couple of patches on the property. I finished the spot where I began in spring, with a dry river bed, some hostas, a couple of rhododendrons, and some hydrangeas. Over the years, I'll divide the hostas, and fill the space, as well as move some purple and white crocus to underplant them with. I'll take some photos and post them soon. And I finally did some grocery shopping. 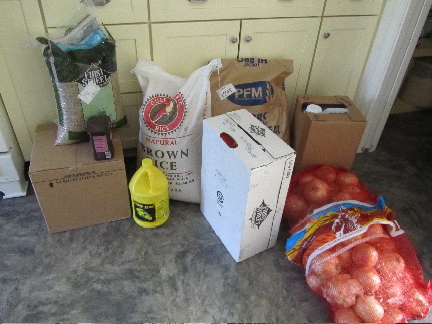 When September hit, I assessed my pantry and went to the restaurant supply to buy what feels like the basics for us. I thought long and hard about which items were our family's essentials. I brought my calculator to the wholesaler, and unit-priced in the aisles. And in almost every case, I went with large institutional sizes. So, fill me in. What's been keeping you busy this last week? Is the huge bag onions? Do you freeze or dehydrate them? Sounds like you have been super busy. We are back in school now but I took advantage of the long weekend to get to work on my knitting and crocheting projects. On the frugality front, we inventoried everything and I made a two month menu. I did my warehouse stock up to round it out and to replace all the things I had used up over the summer. Yes, those are onions -- 50 lbs. I've already used several pounds, and will likely use about 10 pounds in making pickles and salsa in just a couple of weeks. The rest, I store in the fridge. 50 lbs lasts us until Christmas. It sounds like you've been very busy, as well. I don't know how you find time to blog while being busy. I don't seem to be able to do both very well. I hope you find some great books at the library book sale,. We were in a touristy town a couple of falls ago, and the highlight was the library book sale. Whenever I bring up going to that town, that is what everyone in the family remarks about. It never occurred to me to fix socks with an actual patch instead of just trying to sew together the threadbare pieces. What a fabulous idea! Anyhow, I've been cutting them down, giving them some shape, and crafting them into things that I'll actually wear and get some use out of. I'm no great seamstress, but it's working ok, and it's a much better option than buying new stuff. Congratulations on all of your frugal successes. You are such an inspiration! I sew up tiny holes, but sometimes the sock holes get away from us, and patches work better. I've darned wool socks, but I'm not sure how I'd do that with sport socks (because the yarns are so fine). I know what you mean about the event t-shirts. I have a drawer full of them myself. I have a lifetime supply of summer pj tops with them. A good idea to remake them into something else. I saw a quilt that a mom made, once, just out of her son's large supply of t-shirts. Good luck with your t-shirting project! I just love the idea of making homemade ketchup! And I'd never thought of using patches in socks, either (rather than darning them)! 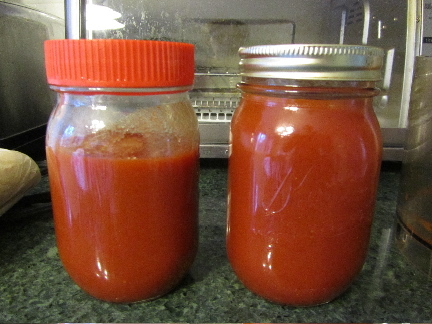 Now that I've made a batch of ketchup, I can see just how easy it really is. I don't think we'll ever buy ketchup again. And I got to control what went into it! Less sugar, no corn syrup, a little lemon juice, and definitely more tomato-y. I only darn wool socks, with thick yarns. 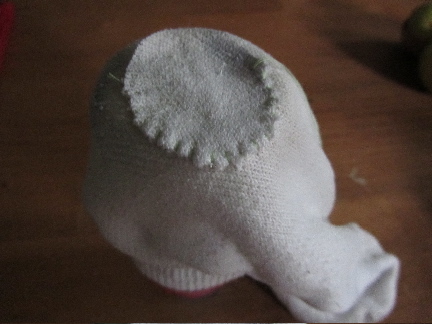 I've never thought to try darning sports' socks. The patches last a few months, so it works for me, and I can do it quickly enough. These socks just have to last 3 1/2 more months. You pick wild berries, right? Did you ever make any wild berry vinegar? I thought of you when I was making the wild blackberry pancake syrup, and how you might enjoy your wild berries in a syrup. I'm not sure where you're going to get your bulbs, but Van Engelen has some amazing prices on bulbs and I have been very happy with them! I ended up mending 7 or so pairs of underwear today. That wasn't planned but it was requested. Now I need to get back to making some more presents for my daughter's upcoming birthday, using things that I already have on hand. 'Thank you for the info on the bulb company!! Funny, just after reading your comment, I went out to the mail, and in my box was a catalog for Van Engelen's and one for their sister company (for smaller orders) John Scheepers. It was just funny the timing on that. I'll go through their catalogs and compare to prices at Home Depot, so big thanks! It sounds like you've been very busy, too! I think making birthday gifts (or any gift) is a lot of fun. It's one of the kinds of frugality that I've always enjoyed. Hope you're enjoying making gifts for your daughter's birthday! You are definitely the Queen of hard work and frugal ideas. Your family is lucky to have you. I know you will do what you have to do, but do you ever think you might crash and burn with the new intensity of saving money and yet maintaining your life style? That's not meant in any negative way. I get tired just reading about your activities sometimes. The activity part of my frugality is something I actually enjoy. The part that drains me is the worry that what I'm doing may not be enough. Stress will be what causes me to to hit the wall. For me, doing all these little things makes me feel good and productive. At the end of the day I can see what I've accomplished. It is heart-breaking, though, when I do something for someone in the family, and they turn their nose up at my work (and that does happen here, occasionally). What I am trying to learn, now, is to disregard any negativity I encounter with all my efforts. And while I work hard, I also play very hard. Vacation time is definitely "me time". But thanks for your concern. I know that you didn't mean anything negative by it. I should definitely try patches on my socks! 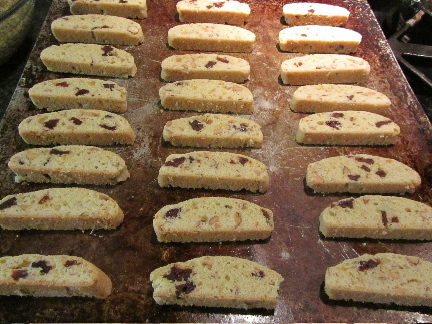 And I love home made biscotti! I make that a lot. You've been busy! I love homemade biscotti with coffee for breakfast. Maybe not the healthiest breakfast, but somedays, that's all I want. I hadn't made any in a long while. 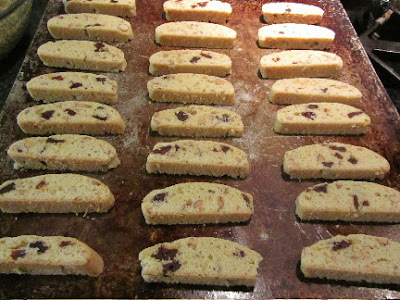 Then a friend mentioned making some, and at a coffee hour at our church, someone brought a batch of biscotti, and it just got me to thinking to make some soon. Lili rocks! Hey, how has college been going for the girls? You have a lot of big changes in your life right now--I think Live and Learn is hinting at you to find a way to take care of yourself and I second that motion. Classes don't begin until the end of the month for them. Some of the universities around here, on the quarter system don't begin until late September. So they've had a really long summer vacation! Goodness, I'm a bit nervous for them. High school really does "baby" students. And I worry that 1st quarter will be a bit of a shocker. Good luck with getting back on track with Weight Watchers. 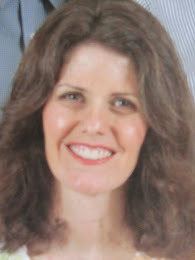 I was watching a TV show the other night, Extreme Makeover: Weight Loss Edition, that I found very inspiring. It's motivated me to up my running portion of my workout. Chris, the host said that running burns more calories than any other activity. Thanks for the reminder on kids' resale clothing shops. I've been having my daughters go through their clothes, and I was just going to donate what we don't want to hang on to. But I should take it over to the nearby kids consignment. A lot of it might not be resell-able, but a few pieces might. Then I can take the rest to donate. Shopping for a wedding dress sounds like a lot of fun. I bet that brought back some great memories! Interesting. I don't know of any quarter systems around here. I bet everyone is nervous--it will be ok once everything starts. I just got back from the resale store. I didn't time this very well. I think every mom in the county took their used clothing there today so my "profits" were disappointing. Lesson learned--get there before school starts and other mothers start going through their used items! Interestingly, a brand new store just opened in our area which buys back teens/college age kid's clothing. Hopefully the store will make a go of it--it will be a nice resource for me in a couple of years when my son hits those clothing sizes. Good info to know, about getting to consignment shops earlier in the season. I am guessing that bringing in items that the next season will need is probably good, too (note to self, don't bring in summer items now). About half of the universities in our area are on quarters. I have a nephew in the midwest, though, whose school is on semesters. His classes began in late August. Of course, he is done for the year in early May, whereas my daughters won't be out until mid June. So, there are trade-offs. I am just glad that my girls worked on campus all summer. At least I feel comfortable with them managing the bus system daily. They have to take two buses to get there each day. And they now are familiar with campus, as they've been cleaning buildings all summer. Oh, the worries of being a mother! If I can think it, I can worry it! The first time I tried resale shops, I took my items in mid-season. I don't think they had a lot of new-to-them stock at that time so I came out further ahead financially. If I had held off for another month instead of going in immediately after Labor Day (when all the other moms are going through their children's clothing) I bet I would have made more money. The children's resale shops in our area request certain clothing at certain times of the year. Makes sense. More people want to buy used snow boots in October than in May. Oh my, I'm drooling over your donuts and biscotti! They look sooo yummy! Keep up the fabulous efforts! Thank you! The donuts were so good that I've been requested to make them again this weekend! Thank you! Just curious, do you have places/food items that you can forage in your area? Foraging begins in spring here, with fiddlehead ferns being quite popular, and ends with the wild blackberry foraging season. I see people with buckets, everywhere in and around town, picking blackberries. Im curious about your french bread donut twists. Can you give me more details about how you made them? 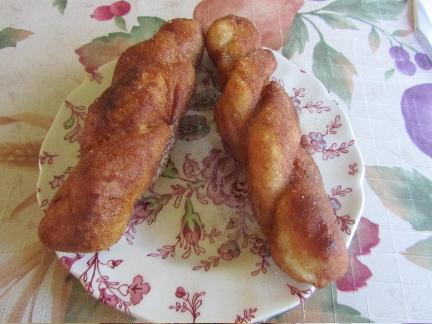 I've had a couple of emails, asking for info on how I made the donut twists. So, I'll take photos of the process and type up my recipe over the weekend (my family requested them again this weekend), and post it this coming week. Anyways, it's just my basic French bread recipe that came with my food processor many years ago, and I added extra sugar to the dough (about 2 tablespoons extra I think, to a batch that would normally make 1 large loaf or 2 smaller loaves, of French bread). But I'll post how I do it all this week. Lili, I was taught how to darn a sock as a child, but never thought to patch them, that would have come in handy with my boys when they were younger as one would tear out the toes the other the heels. I recently purchased a used freezer so now I am busy filling it while finishing up some furniture restoring to sell and will put that money away for Christmas. To relax I am working a cross stitch. Need to get on those Christmas presents I want to make.